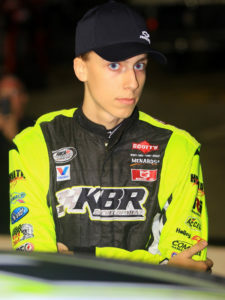 Success has come quickly and repeatedly for Carson Hocevar, a 16-year-old 10th grade student from Portage, Michigan, who is competing full-time in the ARCA Menards Series Short Track Challenge for KBR Development in 2019. Carson started winning early and has continued the theme well into full-sized stock car competition. He began racing quarter-midgets at 7-years-old and went on to earn 79 USAC feature victories and 15 national championships. Under the tutelage of 2008 NASCAR Truck Series champion Johnny Benson, Jr., Carson graduated to full-sized stock cars in 2015 and immediately made an impact by winning an Outlaw Late Model feature at Berlin Raceway in Marne, Michigan as a mere 12-year-old. Later that summer, he earned his first template Super Late Model victory at Berlin as 13-year-old, becoming the youngest winner in both Late Model divisions with his victories that season. Most impressive is that his wins came against several industry veterans at a track where experience is especially paramount. The victory even made national headlines when NASCAR issued an order to park the rookie until his 14th birthday due a minimum age restriction. Carson responded with a breakout season in which he won the Berlin track championship as a 14-year-old — the youngest in NASCAR Whelen All-American Series history — and added three other victories on the regional JEGS/CRA All-Stars Pro Late Model Tour. He has found success quickly on each rung of his racing ladder, a theme he hopes extends into the next phase of his career in the ARCA Menards Series. The Short Track Challenge consists of 11 races throughout the 2019 season, a championship within the much larger championship, his age and quick ascension now separating him from racing at tracks like Daytona, Talladega and Charlotte. Carson will continue to hone his skills in numerous Super Late Model and Pro Late Model events in 2019, driving his familiar No. 14 in-between ARCA starts in the No. 28 — all of which prepared by Zeeland, Michigan’s KBR Development, which has spearheaded his entry into the NASCAR national landscape.